You know Spring has arrived when you start seeing asparagus everywhere. My go-to asparagus dish has to be Asparagus and Prosciutto Bundles and I also like Crustless Crab and Asparagus Quiche. 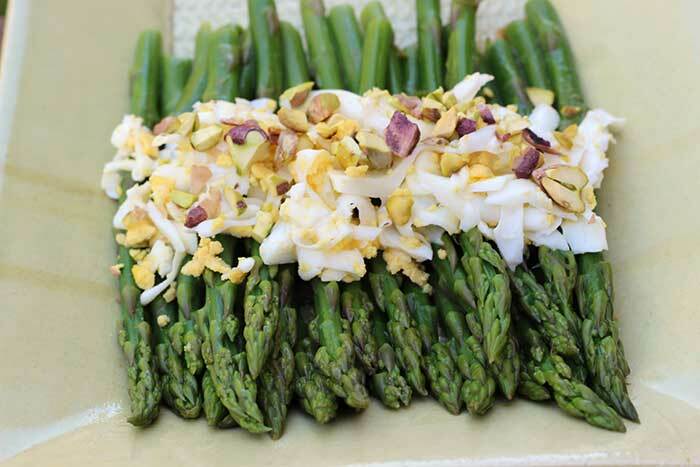 But this Asparagus with Shredded Egg and Pistachios is quickly becoming a favorite. 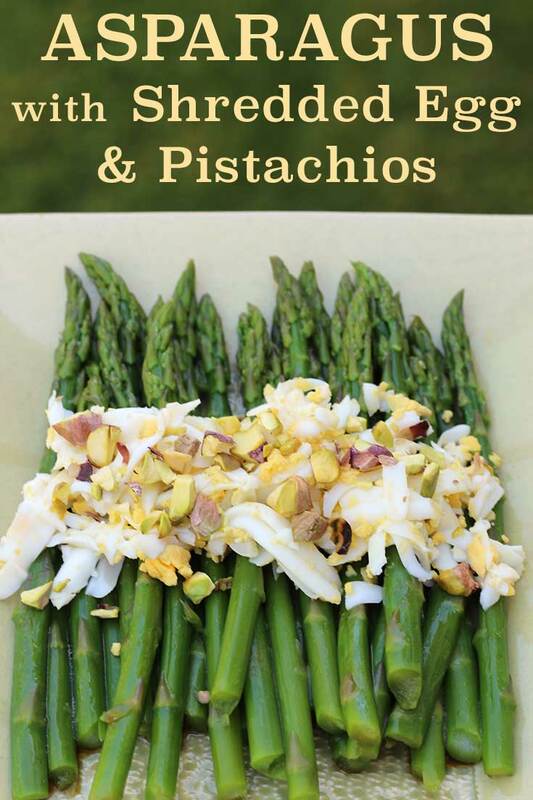 When I saw this recipe for asparagus with shredded egg and chopped pistachios from Put an Egg on It (affiliate link) by Lara Ferroni, I knew I had to give it a try. The eggs give a creaminess and the pistachios lend crunch. Plus the Asian-style vinaigrette delivers some tanginess. I’m not ashamed to admit I ate this for breakfast. There’s nothing wrong with getting in a green veggie before noon. Place whole, shelled pistachios in a small dry skillet over medium heat. Toast, tossing or stirring frequently, until pistachios begin to darken. Remove from heat and let cool. Chop. In a large bowl, whisk together rice vinegar, sesame oil, and tamari/soy sauce. Snap off the woody ends of the asparagus. (Take a piece of asparagus and gently bend it until it snaps. The tender part will be above the break; the tough part will be below.) Discard or compost ends. Rinse and drain asparagus spears. Place about 2 cups of ice in a large bowl and fill 2/3 with water. Place asparagus in boiling water and cook for about a minute. Fish a piece out, rinse in cold water, and taste it. You want it to be tender, but still have crunch. When the asparagus is done to your liking, use tongs to move it to the bowl of ice water. Drain. Move asparagus to bowl containing dressing. Stir to coat. 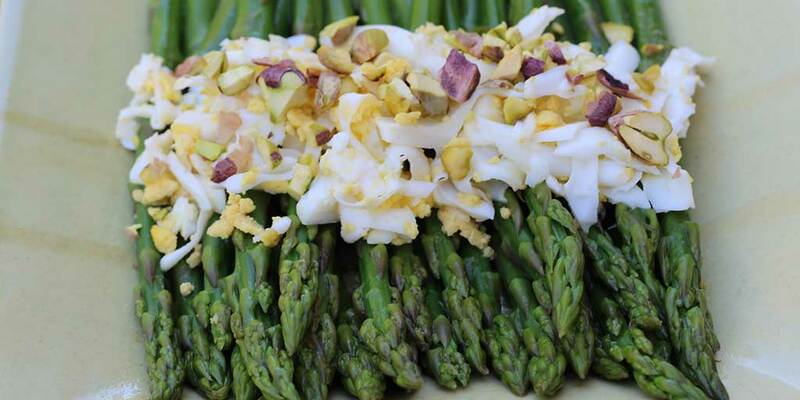 Place asparagus on serving platter. Drizzle on any dressing left in the bowl. Top with shredded egg and chopped pistachios. Use a grater with big holes to shred the hard-boiled egg. If you are watching your sodium intake, make sure your tamari/soy sauce is low-sodium. You may also want to simply use less of the dressing.